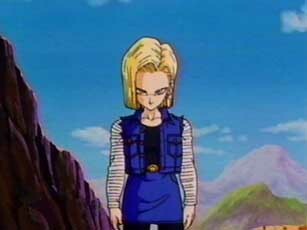 Android 18 and her brother were gang members until they were tricked by Dr.Gero into becoming humans with a few extras. She had many boyfriends in the past but they were all punks. She is not as powerful or voilent as her brother. She ws second to be absorbed by Cell. But she was punched back out by S.S.Gohan 2. She eventaully marries Krillen and has a daughter. She loves shopping and trying on clothes. In GT she fought along side Goku for the battle against her brother.